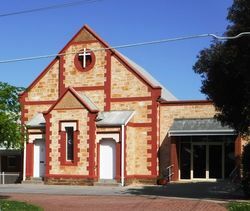 The Grange Memorial Hall built in connection with the Grange Methodist Church, was opened on 11th December 1920 to commemorate those who died in service or were killed in action in World War One. The foundation stone of the Memorial Hall in connection with the Grange Methodist Church was laid on September 18, and on Saturday last the opening ceremony was held. The hall was opened by Mr. R. D. Vawner. 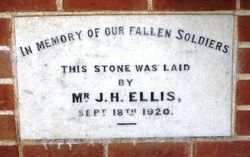 The cost of the hall was £753, and it would stand as a lasting memorial to the men from the church who assisted in the great war. The Register (Adelaide), 17th December 1920.